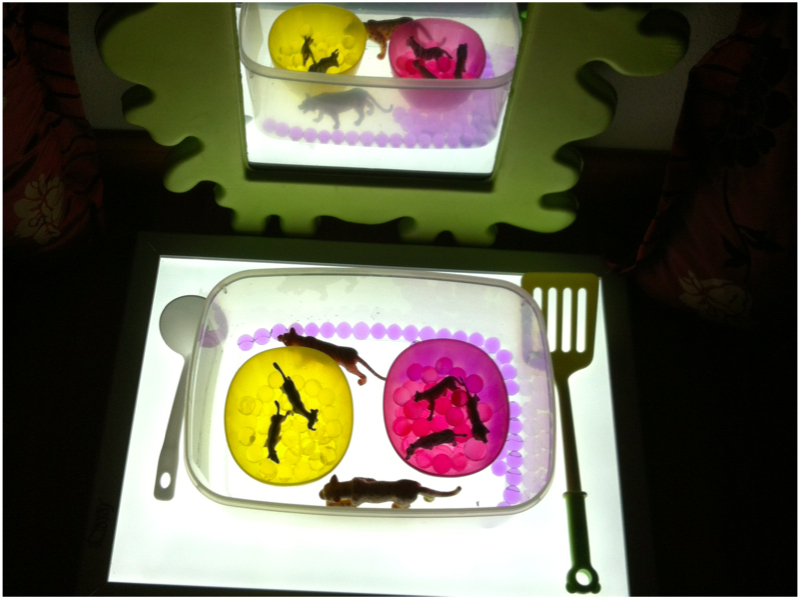 Alhamdulillah, our second theme, Wild Animals, went on for a month. However, compared to the first theme, he seemed less excited and attracted to the display I put up. While there were many non-fiction books I got for him, he was more interested in the books that were not related to the theme. However, all that changed when he found the Zoo Passport I made for him in his wardrobe. (Don’t ask me why his books landed in his wardrobe! :p but if you need to know, our bookshelf is already bursting at its seams and we needed more space for his books :D) He took out the Zoo Passport and started flipping through. 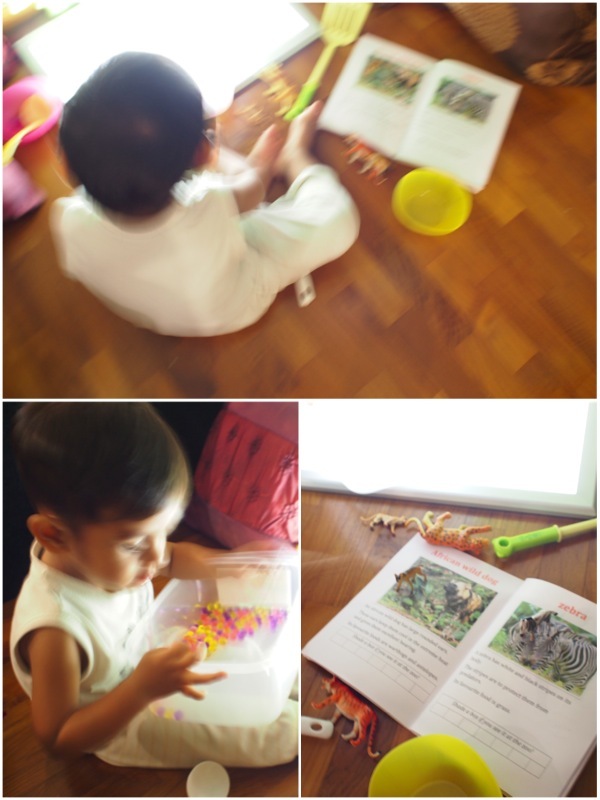 He took his tiger animal figurine and pointed at the white tiger page. That was heartwarming on so many levels. One, I totally forgot about the Zoo Passport. Two, he preferred the Zoo Passport over the rest of the books I borrowed from the library. Three, he flipped the pages and showed me certain wild animals with keen interest while making reference to the animal figurines on the grass patch. I also decided to have a container of waterbeads with his Wild Animals toob in it. It sustained his interest for a week. Amazingly, he never gets bored of the waterbeads. We would play simple games like finding a gazelle or lion among the waterbeads .The Zoo Passport turned out to be really useful. I kinda underestimated my own effort. I also decided to make use of all available resources and space. 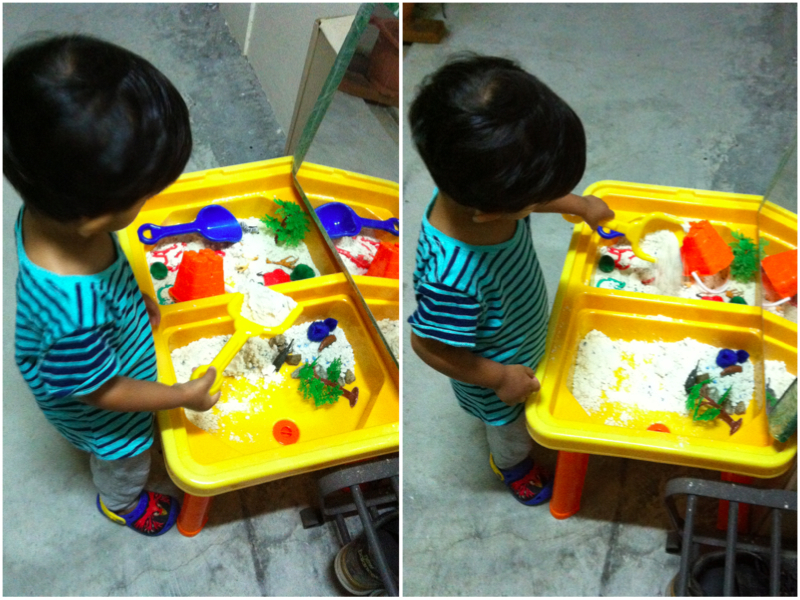 As he is a frequent visitor to the water/sand table outside our home, I decided to make full use of it. I had been eyeing moon dough for months but I put off by the price tag. A small tub with ONE colour costs a whooping $30! Thank you for the Internet and the awesome sharing online, I found a way to make my very own moon dough in various colors! A short instagram video to illustrate on making moon dough. There were pom-poms, animals cookie cutter, toob animals and plants, spades and a bucket. It was definitely a hit for him! He was not aware I was preparing this for him. 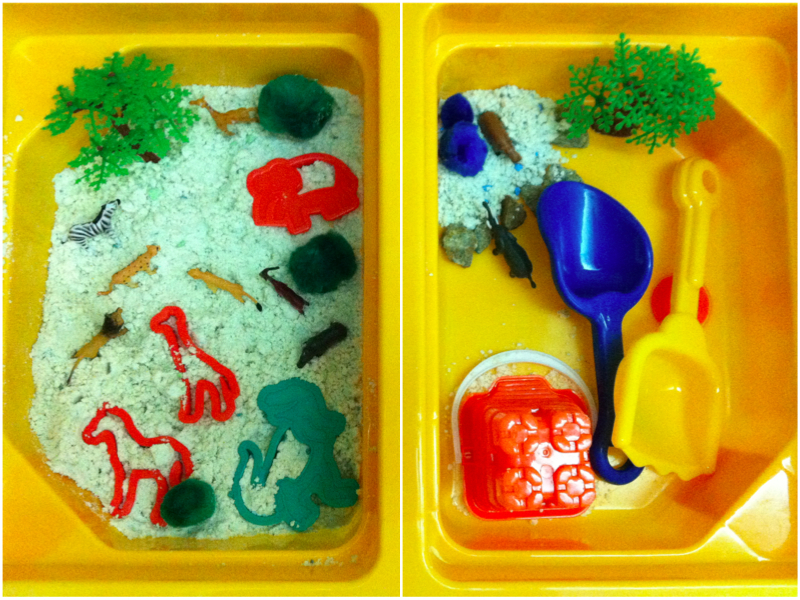 So when he came home the following day, he was super delighted to found something in the water/sand table! When I asked him if he is ready to go inside, he said quickly “no.. Play!” It became his favorite pit-stop for a couple of weeks. We did not do lots of crafts as I did not prep the theme well. Work was drowning me and I lost some mojo along the way. :p However, I am super proud of the two crafts we did because Umar contributed alot! 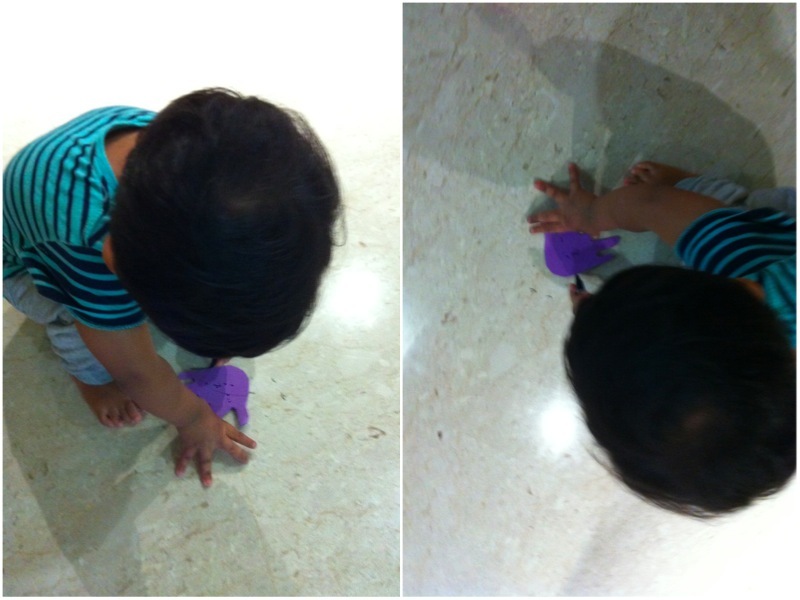 Umar “decorating” his baby elephant. Surprisingly, this turned out to be his favorite. Many nights, he will not go to sleep without bringing it along to bed. 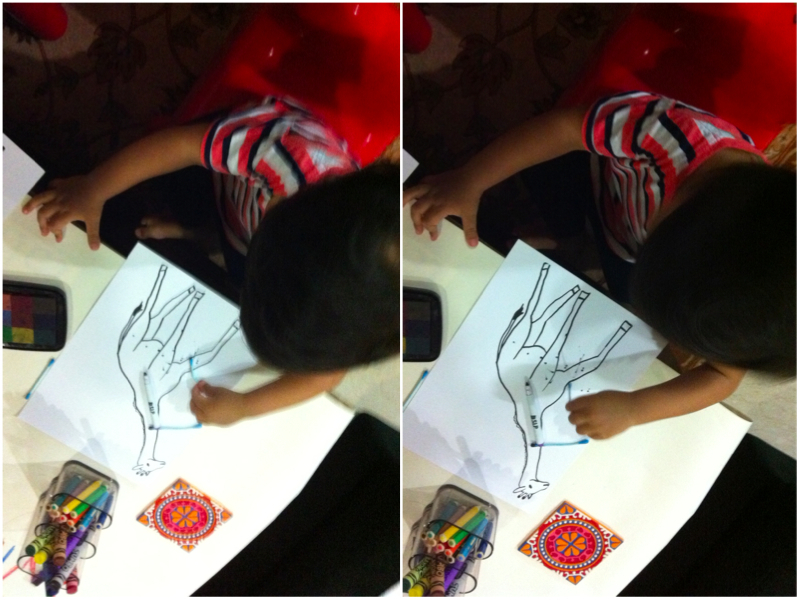 While we were making it, he was initially not willing to offer his hand to be outlined on the foam paper. I drew the outline of my own hand first and soon after, he wanted to nurse. Then he willingly offered his hand to be outlined on the foam paper while nursing. He wanted to help me cut but I realized the scissors I bought for him was too sharp. I showed him that the cut-out can be turned into an elephant. He took the marker and started to scribble on the cut-out of his hand. We named them Ummi Elephant and Baby Elephant. 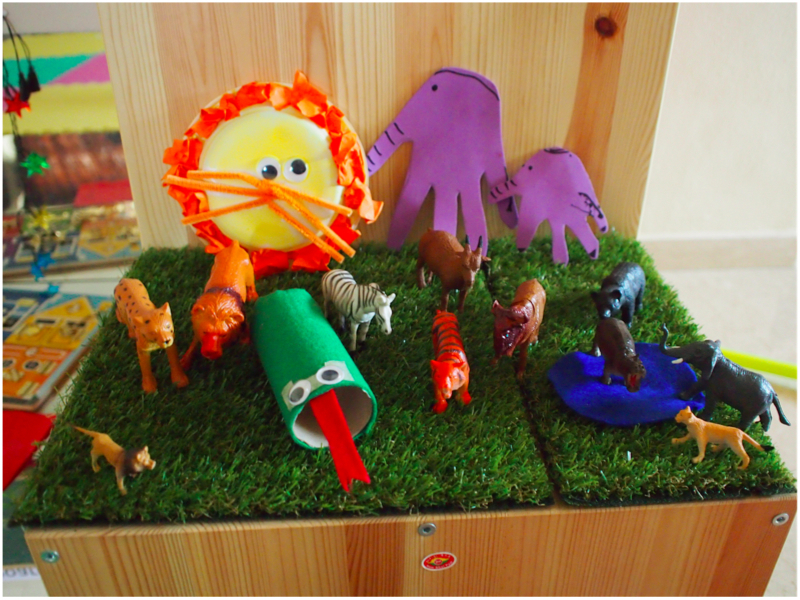 Spot the lion and snake crafts! I love the lion craft because not only, he learnt the skill of painting, he also learnt how to tear paper and crumpled it into balls to make the lion’s mane. I started painting and he followed suit by taking the extra paintbrush and painted with me. I left some extra papers at the side and he started to tear and crumple them to make the mane. 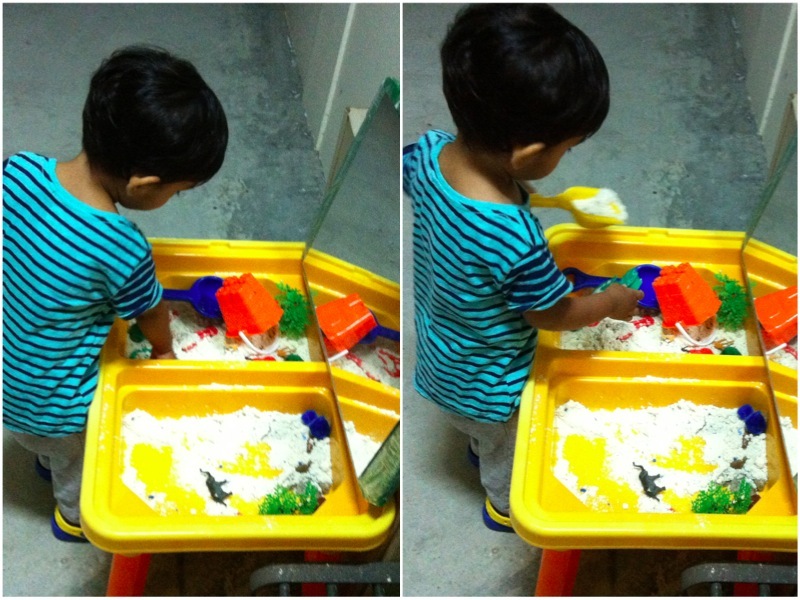 It was a proud moment for me because it is not easy to keep him engage to an activity for long. We did not read many books based on the theme. I ended up reading them on my own and narrating the story to him. He enjoyed it more that way. Surprisingly though, despite him not showing much interest for the display, he noticed them missing when I cleared them two days before moving on to the next theme.